For thousands of years, slavery was the norm for societies ranging from simple tribes to the exalted Greek and Roman empires. If we define “slavery” as one entity having the legal right to the economic output of another human being, then we must honestly look at many more countries — including the United States of America! After the Civil War (an oxymoron) and the deaths of three-quarters of a million Americans – about 3 percent of the population – the USA adopted the 13th, 14th, and 15th Amendments to end “the peculiar institution” which allowed one human to “own” another. That is, the “master” had the right of some portion of the economic output of the “slave” – theoretically 100 percent. Down through the centuries, in spite of slavery’s prevalence and ubiquity this was considered by many to be morally wrong and after decades of argument and in the case of the United States of America, the deaths of over half a million Americans this legal practice was ended – first by the Emancipation Proclamation and then by the aforementioned Amendments to the U.S. Constitution. At the founding, the founders had seen and foreseen that Congress would eventually attempt to enslave all citizens and they prohibited income taxation, however, in 1913 Congress, with the agreement of at least three-quarters of the state’s legislatures, bypassing the 16th Amendment to the Constitution imposed a new system of slavery. A new system of slavery whereby every citizen was to have some proportion of their economic output subject to involuntary seizure by the government. Every year the Internal Revenue Service rips from the hands of honest, deserving citizens some portion of their legally gotten gains. 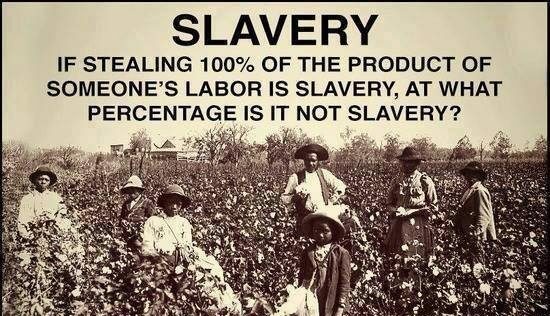 Every year we seem to argue about what that percentage should be, but never do we challenge the whole concept of the slavery this practice represents. We seem to have forgotten that hundreds of thousands died to establish that slavery — in all it’s forms — is immoral. This immoral practice is known, of course, as the Income Tax. It is time to again abolish slavery, repeal the 16th Amendment and pass the FairTax Act (H.R. 25).